A colour photograph of a farm in the Miniature Village at Cullen Gardens. The farmhouse is a replica of the Duncan Farmhouse at 125 Moatfield Drive in Don Mills, Ontario. The red barn, silo, and drive shed are replicas of a barn, silo and drive shed located in Pickering, Ontario. 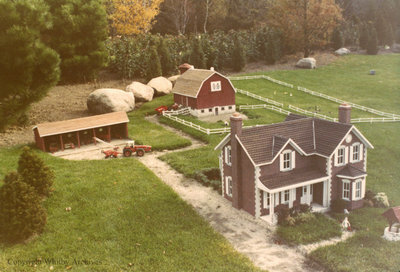 Farm in the Miniature Village, Date Unknown, Photographer Unknown. Whitby Archives A2013_042_171.